Background image of Farmland below a blue sky with hills. As the swing states of Pennsylvania and Ohio decided the White House race this fall, another drama — perhaps of greater long-term importance — was playing out on the ground on election day, well below the national media radar. Communities in those two states, joining a growing number across the country, cast a vote for self-determination, by passing local laws that establish inalienable rights of nature and the community, and ban dangerous practices such as hydraulic fracturing for shale gas. 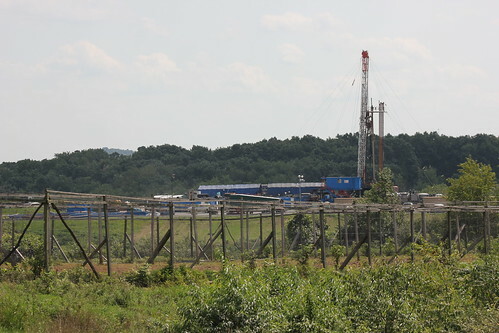 Drilling for natural gas via hydraulic fracturing is rampant across Pennsylvania. Photo by wcn247 via Flickr. It’s part of a growing nationwide movement, inspired and encouraged by a little-known, forward-thinking Pennsylvania-based group called the Community Environmental Legal Defense Fund. The aim is to reverse the national trend in which individuals and companies legally degrade the clean water, soil, air and broader ecosystems that people and communities depend on everywhere. “It’s really about elevating the rights of people and communities and nature above those of commerce and corporations,” says Mari Margil, CELDF’s associate director. The legal defense fund has been instrumental so far in educating communities across the country, and, increasingly, around the world about the shortcomings of legal structures that promote the interests of environmental exploitation, over the interests of communities that will face the direct impact of those activities. On the whole, laws fail to protect the most basic things such as community water and food sources, in the face of the powerful interests of a mining or livestock corporation. CELDF’s efforts grew out of legal assistance given by founder Thomas Linzey to Pennsylvania communities looking to stop incinerators and mining quarries in the 1990s. Soon, CELDF and Linzey realized that although certain appeals could waylay developments, most activities were eventually approved because they were legal under state law, regardless of their long-term harm to communities. Linzey and Margil also worked with the Quito-based Fundacion Pachamama to collaborate with members of Ecuador’s constitutional assembly in drafting rights of nature provisions for the new Ecuadorian constitution adopted in 2008. As fracking has swept across the nation, CELDF is helping organize more and more communities in Ohio, New Mexico, New York State, Maryland, and Pennsylvania to follow in Pittsburgh’s footsteps to ban fracking and establish bills of rights. The movement is gaining momentum, sharpening its tactics and overcoming all sorts of obstacles. In Spokane, WA, where CELDF has been organizing since 2007, local partner Envision Spokane badly lost a community bill of rights ballot measure push in 2009, as the city council aligned with business interests to defeat the measures. Emboldened, the movement pushed a bill of rights again in 2011 and lost by a single percentage point. The Envision Spokane movement plans to be back with another measure in the fall of 2013. Towns in New Hampshire’s lake region have learned from several unsuccessful efforts to use existing laws to fight water mining by drinking water companies; Barnstead, NH has now become the first town in the nation with an explicit ban on corporate water mining. In that light, this movement is just hitting its stride.